Today marks 4 months since Kyleigh was born into Heaven. Sometimes I think the anticipation leading up to days like today are worse than the actual day. I was a mess yesterday. Cried at the drop of a hat. We took the boys to a movie in the morning and had a great time. The boys were so excited to see the new Thomas the Train movie on the big screen and we loved hearing Oliver sing along to the songs. We stopped at one of our favorites, Red Robin, for lunch on our way home. Then we got home. And it hit me. The tears started flowing and didn’t hardly stop until God delivered what I needed. We have been in a major drought this summer. No rain and hotter than usual temperatures. Last night after dinner, Rodger convinced me to step outside with him and the boys. I really wasn’t in the mood, but a cool front was blowing through and it sounded nice to get out without it being 100+ degrees out. As I stepped outside, it started to sprinkle. Not much, but just enough. The sun was still shining and all I could think of was, “Please God, send me a rainbow.” I searched the sky and saw nothing. I told the boys to keep their eyes on the clouds because when there is rain and sunlight at the same time, there is sure to be a rainbow. Of course, the rain did not amount to much more than a few sprinkles every few minutes. 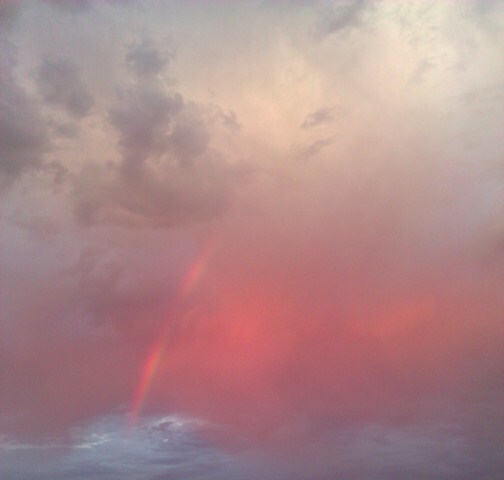 I quickly became disappointed because I knew it wasn’t enough to make the beautiful rainbow that I had been hoping for. The boys wanted to take a walk, so we ventured down the street. As we got to our turn around point, I looked up and saw the smallest sliver of a rainbow. It was just enough to make me smile and make me content in my wish. Nobody saw it but me. The boys were already too far ahead of me to call them back, so I enjoyed the bright colors all to myself. I thanked God and turned towards home. That’s when I saw it. One of the biggest rainbows I have ever seen, right over the top of our house. It literally looked like the rainbow was engulfing our home. It started on the left side and ended on the right. No other house underneath. I’m sure God got a good laugh out of this one. He was making sure I knew who was in charge and that He wasn’t done yet. He was also giving me the reassurance that I needed yesterday. Kyleigh is okay. She is safe in heaven and resting in Jesus’ arms. While we continue to grieve for Kyleigh and miss her terribly, God is holding us in his hands, just like that rainbow was holding our home. There was an immediate sense of peace and calmness that came over me. I asked Rodger to take pictures with his phone and I think we ended up with a few dozen. It was absolutely beautiful. We ate our dessert on the deck out back and went in shortly after to get the boys ready for bed. As I went in the kitchen to close the blinds, God showed me that He wasn’t done yet! Another wonderful rainbow graced the sky behind our house almost an hour after the first one. The top of the rainbow was covered in clouds, but the left and right sides were clearly visable. By this point in the evening, the sun was beginning to go down and the sky was no longer blue, but pink. 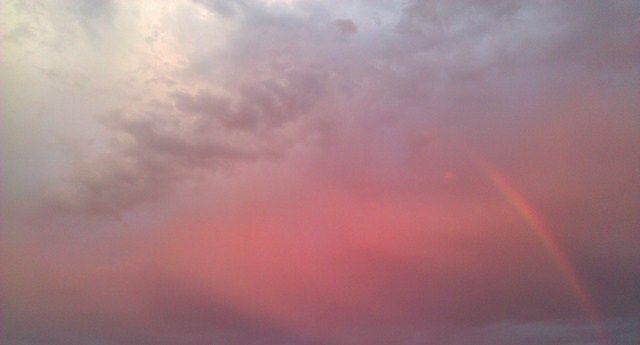 The most beautiful pink clouds surrounded the rainbow. The brightest pink that I have seen in the sky in a long time. This time I grabbed my phone and started snapping photos. God showed me three times last night that Kyleigh is at peace, free of pain and full of joy. Each time was more beautiful then the one before it. All of these rainbows in the sky above our house where only a few sprinkles fell. God knew what I needed yesterday and He provided, just like always. 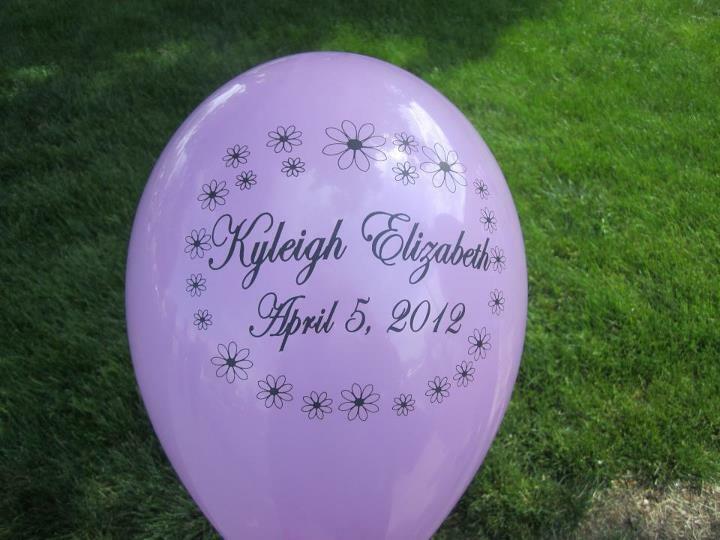 Happy 4 months in Heaven Kyleigh! We love you!